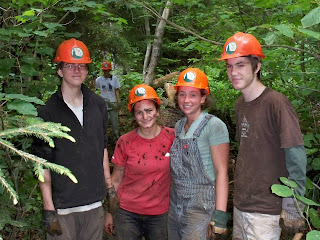 AMC Trails Blog: Berkshire Teen Trail Crew '09 Week One! 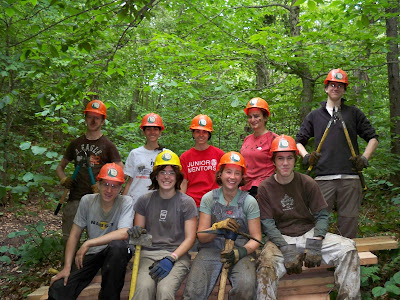 Berkshire Teen Trail Crew '09 Week One! After four weeks of training last Sunday marked a momentous occasion for the Berkshire Teen Trail Crew Program…the arrival of teens! I personally was convinced that they were never coming, and was therefore pleasantly surprised when all but two of our nine participants arrived. I was even more surprised to note that they all seemed to be toting remarkably well packed backpacks and large smiles. I liked this crew already! Our week was to be spent on the side of Massachusetts largest summit, Mt Greylock, working on the overlook trail. 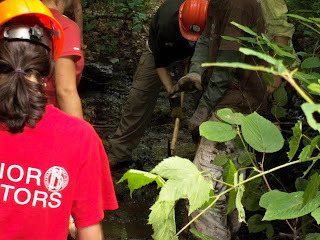 Our main priority for the week was installing forty feet of bog bridging along with a long list of other fixes for the trail. With our bellies full we managed to complete our five bog bridges, one water bar, two mini staircases, a check step, clear three drainages and brush in some braided trail spots. Not to mention we played an insane amount of a card game know as ERS, some hilarious rounds of a sheraids type game and had enough discussions about Napoleon and world history to make any professor proud. It was great to see everything finally come together and really beginningg to see what this program is all about. We could not have asked for a better crew for our first week and I am so grateful for all the hard work they put into the trail. All in all a great start to our summer!